Do you know an area high school senior heading up to Iowa State next year? Let’s get their Cyclone days started right with a scholarship! The Iowa State Alumni of DFW sponsors two scholarships to Iowa State for first year freshmen entering ISU. The application process for the upcoming Fall 2019 school year is now closed. Two scholarship awards of $1000 each are available from the Iowa State Alumni of Dallas / Fort Worth to a first-year female and male college student from a DFW Metroplex area high school (resident of Collin, Dallas, Denton, Ellis, Johnson, Kaufman, Rockwall, or Tarrant Counties). Students must have completed the FAFSA and be admitted to Iowa State University (parents do not have to be alumni). Each applicant is eligible to receive only one of the two annual scholarships. Students must be admitted to Iowa State, have completed the FAFSA, and rank in the top 25 percent of their high school graduating class. Selection will be based on leadership capabilities, academic achievements, character, and personality, with a special emphasis on financial need. All awards shall be for one (1) year only. 2019 Scholarship winners and their families will be recognized at our Senior Sendoff Event on Saturday August 3rd. 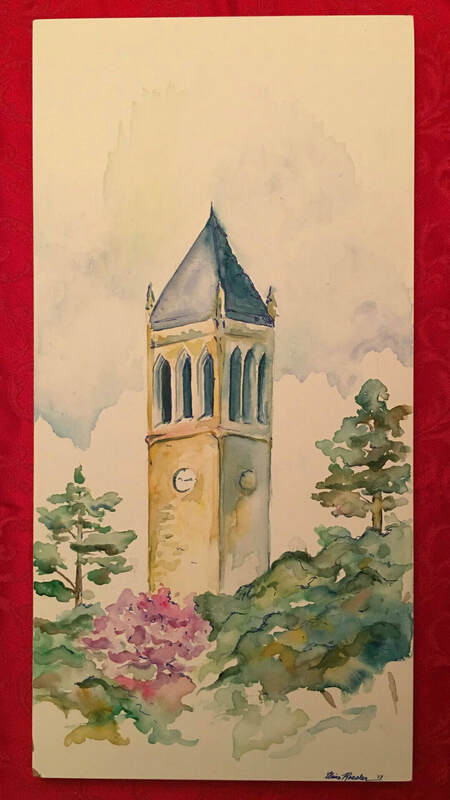 For more Iowa State University scholarships, please click here. Please note that any banner advertisements on this or any other page of this website have no connection to the DFW Scholarship program. Banners advertisements are required to keep the website costs low. If you, your family or your company are interested in becoming a major donor to the DFW Cyclone Scholarship fund please contact us at DFWCyclones@gmail.com. All donations are greatly appreciated and there are multiple awards that we can add to the existing program. We have also set a goal to grow our scholarship program to have at least one fully endowed scholarship in place by 2018. Scholarship endowment through Iowa State now requires a $50,000 donation. We would be honored to have a scholarship with your family or company name through the club to help first year college bound students going to ISU from North Texas. Please contact us if you are interested. A heartfelt "Thank You!" to everyone who continues to support our efforts. This year's raffle sales exceeded all expectations. We are well on our way to an endowed scholarship. The DFW Club of Dallas awarded $5000 in scholarships to new students heading to ISU from North Texas over the past four years. We would love to expand on that great start by offering both larger award amounts and more scholarships in the coming years. Please consider buying some tickets to further this great cause. The DFW Club of Dallas awarded $3500 in scholarships to new students heading to ISU from North Texas over the past three years. We would love to expand on that great start by offering both larger award amounts and more scholarships in the coming years. Please consider buying some tickets to further this great cause. Claire Roesler is a 2017 Iowa State graduate in Nutritional Sciences and is currently pursuing her passion of Dentistry at the University of Minnesota. She is extremely passionate about Iowa State and was involved in numerous organization on campus including SALC, Homecoming Central, CY Squad, YLH Co-Chair, Pre-Dental Club and many more. She was actively involved in her sorority and campus. Throughout college, Claire continued to pursue her passion of art in her spare time. She has done multiple pieces for homecoming designs, the ISU Alumni Association, and gifts for her friends. Feel free to check out more of her pieces on her Facebook page "Art by Claire Roesler" for more of her work. For the third consecutive year we have raffled off a one of a kind item to raise money for the DFW Cyclones Scholarship Fund. 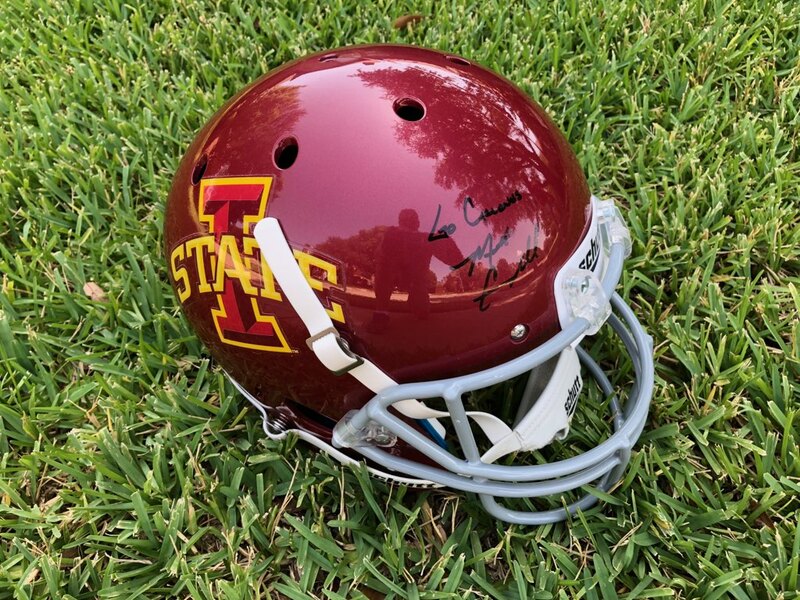 This year we had an authentic Riddell replica football helmet signed by Cyclone football coach Matt Campbell. The DFW Club of Dallas awarded $2500 in scholarships to new students heading to ISU from North Texas over the past two years. We would love to expand on that great start by offering both larger award amounts and more scholarships in the coming years. Please consider buying some tickets to further this great cause. For the second consecutive year we had the honor of raffling off an item that was handmade by one of our benefactors. Nancy Thornton, mother of recently graduated Cyclone Football long snapper Spencer Thornton created and donated this beautiful ISU inspired afghan for us to raffle off to raise money for the ISU Club of DFW Scholarship Fund. The afghan measured 76"x52" and as you can see from the picture to the right, it was created with artistry and expertise. Nancy and her family recently moved from Marion, IA to Michigan to be near extended family. We met Nancy at the 2014 Cyclone game in Austin and then again in Fort Worth and she was inspired to contribute this wonderful afghan after seeing the quilt we raffled off in 2014. We are very grateful for her generosity and greatly appreciate her support of our club. We are thrilled and honored to announce that we will be raffled off a handmade Cyclone quilt at our gamewatches in 2014. This quilt was created by Mrs. Sandy Taylor of Mt. Ayr, IA. Sandy is a dedicated Cyclone mom, grandmother and fan as well as the mother of our Gamewatch Coordinator Lead, Jackie Bohn. This quilt measures 80" by 80" and took approximately 400 hours to make. The money raised was be used to support our inaugural scholarships for students heading to ISU from North Texas as well as other DFW Club causes.